Population growth in the Blue Nile Basin has led to fast land-use changes from forest to agricultural land, which resulted in speeding up the soil erosion processes producing highly negative impacts on the local soil fertility and agricultural productivity. The eroded sediment is transported downstream by water and sinks in the lower basin where it significantly reduces reservoir storage and irrigation canals capacity. The only effective solution to mitigate the sedimentation problem is to limit the sediment inputs from upstream by locally implementing erosion control practices. However, given the vastness and remoteness of the involved areas, this first requires the knowledge of the most critical zones. 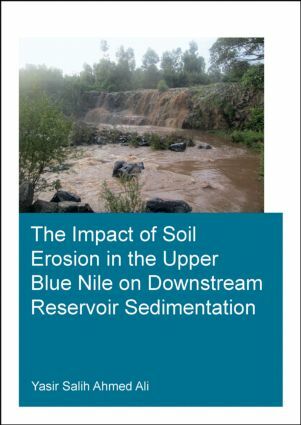 The book identifies the sources of the sediment depositing in the Lower Blue Nile Basin and quantifies the amounts involved providing essential information for the planning and implementation of any interventions aiming at reducing soil erosion. The methods used consist of extensive field work covering most of the basin, watershed, hydrodynamic and morphodynamic modelling and, for the first time, the mineralogical analysis of the sediment at the sources and sinks. The method is successful in indentifying the areas providing most of the transported sediment, where it is recommended to start with erosion control practices. Dr Yasir Ali has considerable experience in many aspects of river engineering gained during 14 years of practice. His main expertise is in river hydraulics and river morphodynamics gained through his involvement in projects dealing with river morphology. Dr Ali played a major role in field investigations and hydrographic surveys throughout his years of involvement in applied research. He gained a strong theoretical background during his M.Sc. study and Ph.D research in the Netherlands. He worked on hydrodynamic modeling for the entire Blue Nile River, from Lake Tana to Khartoum, using the Delft Sobek software. In 2009, Dr Ali conducted a trans-boundary bathymetric survey along the Blue Nile River in both Ethiopia and Sudan, sampling bed levels and suspended sediment. He worked in the Watershed Management Program under the Eastern Nile Model Program (ENMP) in the Eastern Nile Regional and Technical Office (ENTRO), from April 2012-July 2012, Addis Ababa (Ethiopia).